Nearly half of all Carnegie Mellon University graduates take classes in the Department of Modern Languages. In any language, that's saying something. Forty-eight percent of 2018 Carnegie Mellon graduates took a Modern Languages course. Nationwide, there are only 7.5 modern language course enrollments per 100 students, according to the most recent report conducted by the Modern Language Association. For Susan G. Polansky, the head of CMU's Department of Modern Languages, that participation rate, and the fact that it has held steady since the university began tracking data in 2003, is remarkable. Susan Polansky speaks at the Department of Modern Languages Centennial celebration. 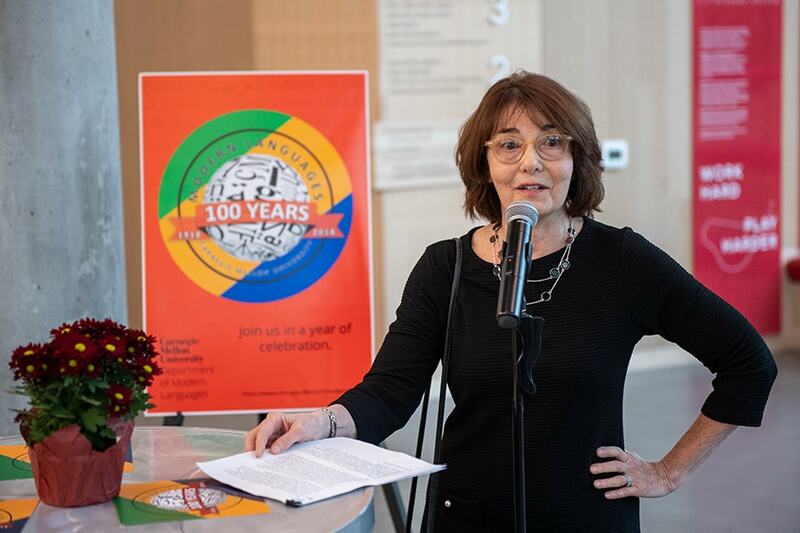 "Celebrating 100 years of modern languages at Carnegie Mellon has brought the opportunity for festivity and reflection about engagement with multiple languages and cultures on campus and beyond," said Polansky. According to Polansky, many factors contribute to the department's success at attracting participation across campus. "Given the profile of many of our students who are on a professional path that has a global dimension to it, you might say that Carnegie Mellon students just get it," Polansky said. "They understand the importance professionally and personally of having multi-lingual, multi-cultural expertise." Polansky said that many CMU students come with good experiences in high school language classes. Others envision working for a global company and realize that language skills will be invaluable. Some students are looking to learn the native language of a significant other, or the heritage language of their family. Dervla McDonnell, who graduated with a bachelor's degree in art in 2015 and a master's of arts management degree in 2017, started taking Japanese for fun her freshman year at CMU. "It was refreshing to meet people from different colleges within CMU, many of whom I would have never interacted with otherwise, and bond through our mutual desire to learn Japanese," she said. Over her college career, she declared a second major in Japanese studies, and spent the summers of 2013 and 2014 studying in Himeji, Japan. "I had no idea that this class I decided to take 'for fun' would lead to many life-changing relationships, experiences, and ultimately influence my overall career path in far bigger ways than I could have imagined," McDonnell said. "Thanks to Modern Languages at CMU, I have caught the language bug for life." Amy Burkert, vice provost for Education, spoke at Modern Languages' 100th Anniversary celebration in October. "Students at CMU want to take language, not because they have to do so but because they want to, at numbers that are the envy of peer institutions," Burkert said. "The Department of Modern Languages has had a real, tangible impact on our students, faculty, institution and community that has contributed to our climb to a global stature." This is no surprise to Bonnie Youngs, a teaching professor of French and Francophone studies and the director of undergraduate studies in the Department of Modern Languages. "Ask anyone about our department's outstanding teaching and research, our ability as a department to retain student interest even though a course in Modern Languages isn't required for CMU students, our active presence at campus events, and our engagement on committees at the college and university levels," Youngs said. The Department of Modern Languages offers undergraduate programs in Arabic, Chinese, French, German, Italian, Japanese, Russian and Spanish. Faculty encourage students to find opportunities to develop and apply their on-campus learning, and the department partners with CMU's Office of International Education to help students to create their own study abroad experiences that could include an internship, volunteering, doing research, or some combination. They also will launch this fall, in collaboration with the Department of English, a Master of Arts in Global Communication and Applied Translation program with a 4+1 option for undergraduates. As part of the department's centennial celebration, it will host a faculty and student research symposium entitled, "Modern Languages Anniversary Symposium, Communicating Across Cultures," from 10 a.m. to 4:15 p.m. on Friday, Feb. 22, in the Cohon University Center. Austin Saunders chose to study abroad in China, and took this photo of the Shanghai skyline at night. 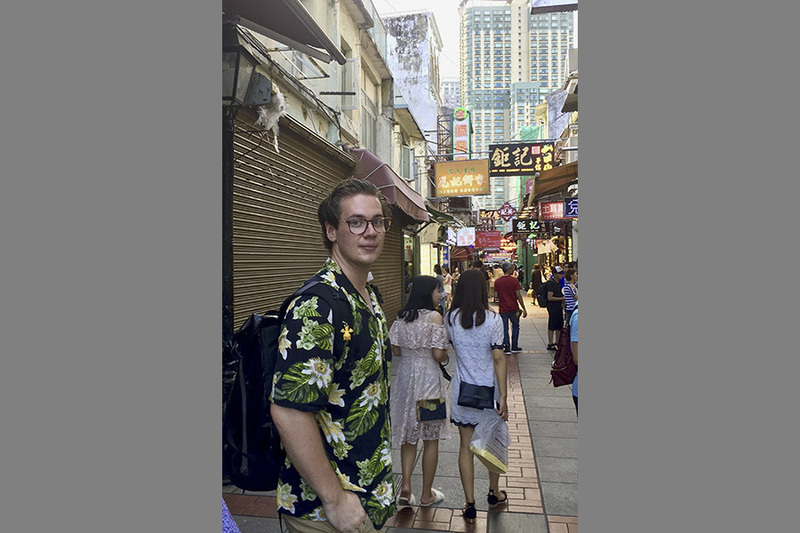 Austin Saunders poses for a photo during his study abroad in China. Kyra Balenzano in Granada, while studying abroad in Spain. Michelle Zhu took this photo of the light show at the Rouen Cathedral in Normandy during her study abroad in France. Theresa Abalos poses for a photo with a group of musicians in Argentina during her study abroad there. 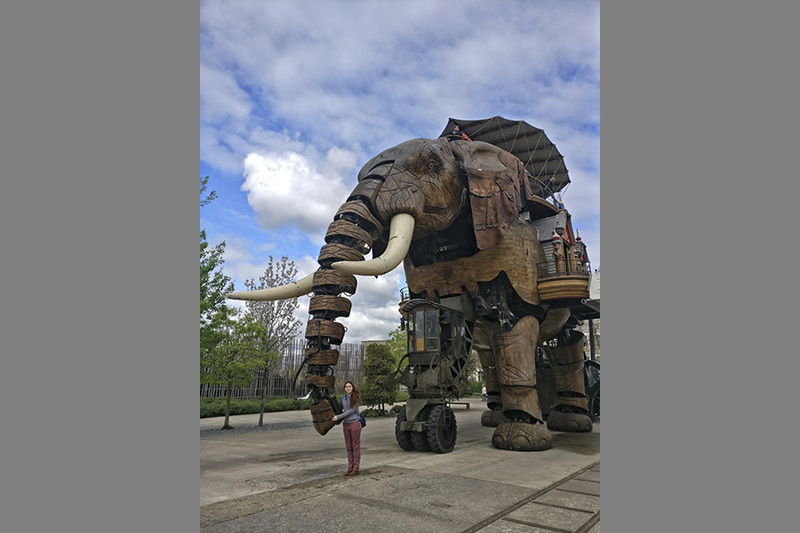 Sonya Anopa poses with a giant mechanical elephant in Nantes, France during her study abroad.